The cluster of Jordan Valley villages located around Fasayil offer a twisted microcosm of the fickle barbarity of Israel’s illegal occupation. Families who seemingly share land, live side by side with no separation except the invisible borders enshrined in Israel’s military law. Yet, as you tread amongst the stones between the close lying villages it is clear where the limited rights afforded to Palestinians ends and the increased terror of the occupation begins. To the south lies Fasayil, which is classified as Area B under the misleadingly named Oslo Peace Accords. Because of the status afforded to it by the 1994 treaty, villagers are entitled to build schools and houses, as well as run water and electricity to their homes. Life is by no means perfect, and the Palestinians who live there are still deeply affected by Israel’s occupation. Yet, being in Area B does afford them a limited right to education and healthcare. Just under five kilometres to the north is the village of Fasayil al-Fauqa, classified as Area C under Oslo. In 2008, after a project by Jordan Valley Solidarity to build a school, Middle East peace envoy Tony Blair negotiated a special status for Palestinians living there. All solid structures built since the signing of the 1994 Oslo agreement were allowed to stand, despite being ‘illegal’ under Israel’s punishing military law. Yet Fasayil al-Fauqa is still Area C, and these small gains can be cruelly taken away at any time the occupation decides. Nestled between the two, Fasayal Al Wusta is home to a small community of Bedouin, many of whom travelled to the area from Bethlehem during the late 1980s and 90s following harassment by the army. Fasayal Al Wusta lies in Area C, and it’s inhabitants are thus denied the basic necessities afforded to their neighbours in Area B. This includes water, and electricity from the power lines that criss cross above their homes to Area B and the surrounding agricultural colonies (settlements) of Tomer and El’Fasail. 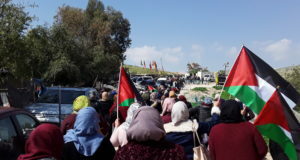 As a further affront to their human rights, the Bedouin must watch as families a few hundred metres away in Area B receive rice and cooking oil from USAID, and American boxes litter the bumpy road that connects the villages. The only benefit for one family is a cardboard box serving as a makeshift toy box, emblazoned with a ‘gift from the American people’. Now the little these families have is under threat from demolition orders served by the Israeli Occupational Force (IOF). At any time these men, women and children – some as young as 2 months – could be woken, perhaps at 5am, to the sound of confrontational soldiers barking orders that they leave their home. Then, without even a minutes respite to collect their belongings, they may have to watch as a bulldozer and it’s emotionless driver proceed to destroy what has taken years to build. Over the weekend of 15th-17th April the army came to the village, taking photographs of the condemned tents and their occupants. It is feared the bulldozers will come when the weekend passes. The demolition orders were served at the beginning of March by a court in Bet El military base, just outside Ramallah. As the Bedouin carry a Jordan Valley identity card they are all but denied the right to defend their homes, as entry into other areas of the West Bank can be a lengthy process. Whilst a lawyer represented the families, he could only gleam a one month stay of execution. That brief period expired on the 9th and 10th of April. 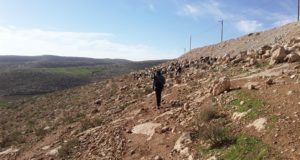 It is difficult for the Bedouin to leave Fasayal Al Wusta because the men have jobs in the area, the majority earning 50 shekels (£10) a day picking fruit and vegetables in the fields of Tomer settlement. The produce, ranging from bananas to aubergines and dates, are then packaged and shipped to Europe, Israel and the Middle East. Whilst grown on Palestinian land, stolen in 1948 and approved by the international community under Oslo, profits are for Israeli’s only. Now the families fall to sleep at night uncertain of what the next twenty four hours may bring. In a show of strength and resilience, they sit and watch TV amongst belongings that could lie flattened and unrepairable come morning. Maybe the bulldozers will arrive by daylight, maybe they will never come. It is an agonising wait, and an integral element of the psychological war being waged against Palestinians across the West Bank. And on this stretch of land spanning the eastern part of the Occupied Territories the suffering is rapidly intensifying. In the Israeli state’s drive to ethnically cleanse the fertile land of all Palestinians, the Bedouin of the Jordan Valley suffer constant harassment that extends beyond house demolitions. In February, the Israeli Boarder Police descended upon Fasayal Al Wusta at 1am with megaphones and aggression. They demanded that every man in the village over the age of 15 years had five minutes to make their way to the playground a short walk away in Fasayil. The men were detained for an hour, and it was claimed that the Police chief had a problem with the amount of stones in the road. 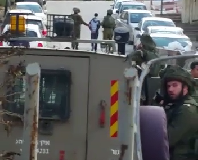 A month earlier, two brothers were arrested and taken to Ofar prison near Ramallah again on a spurious charge that the Police chief had taken a dislike to large stones in the street. They were released after two days, but without their identity cards – meaning they couldn’t travel or work. Yet, they had to make the trip back to Fayasal Al Wusta. In order to return home it was essential they avoided Israeli checkpoints, as they would be arrested again. So they took a treacherous trip across mountainous back roads in a private taxi. The cost of the journey was 300 shekels, and each brother had to pay a further 1,000 shekels for a new identity card from the Palestinian Authority. In the three week period it took to receive the cards neither brother was able to earn even a shekel. These payments are part of a wider economic squeeze on the already poverty stricken Bedouin, which include bail payments for arrested animals and fines if sheep or cattle wander over to the wrong side of a road. It seems the Israeli’s are becoming tired with the capacity of Bedouin families to restart their lives following each demolition. With one tent destroyed, they move a little further across the land and rebuild again. If Israel can bankrupt them, perhaps they will get the Zionist message they are not welcome on their own land. Or, if the international community can get it’s act together, maybe Israel can be told it has to end it’s apartheid laws and hand the Jordan Valley back to the Palestinians.